If you squint and turn your head then New Zealand looks a bit like a boot, so it’s only fitting that its capital city is called Wellington. No, it was actually named after the first Duke of Wellington, a British man from the 19th century, but there’s nothing old or fusty about the city today. Wellington is cool, contemporary and becoming increasingly popular with expats and travellers. Aussies don’t have to go far to get there (just a quick flight across the Tasman Sea) and the Kiwis are happy to share the city with anybody. All prices listed are in AUD ($). By global standards, Wellington is fairly compact and small (290 sq km), but the same cannot be said for its ambitions: its motto is Suprema a situ, or ‘supreme by position’. Situated at the southern end of the North Island, Wellington is nestled between stunning green hills and a beautiful rugged coastline. The almost perfectly circular harbour has become an iconic part of the city, lined with trees, promenades and cafes. Hold on to your hats, though; Wellington is the windiest city in the world, with average wind speeds of about 27 km/h (16.7 mph). Being right in front of the narrow Cook Strait means life in Wellington is far from still. The boats in the harbour can get pretty lively at times! While we’re talking accolades, Wellington is also the most remote capital city in the world, in that it’s the furthest away from any other capital. Don’t worry, though – remote doesn’t mean lonely. The Wellington region may have been explored by Maori tribes as early as the 10th century, but the modern city wasn’t founded until 1839 when the New Zealand Company arrived from England. They thought it would make a great place to live, and quite right they were, too. Arthur Wellesley, the first Duke of Wellington, was something of a celebrity in England after his success at Waterloo, so they decided to name the city after him. In 1865, Auckland lost its crown and Wellington became the capital city. We humans generally like our capital cities in the centre of countries, and Wellington is as central as you can get. Expect a bit of a drop-down from the sweltering temperatures of Australia; the average temperature of Windy Wellington year round is 15-20 °C. It never soars too high or plummets too low, generally staying between 25 °C (in summer) and 4°C (in winter). However, it’s the cold winds you’ve got to watch out for, especially the southerly gusts in the winter that hit the city, so wrap up warm. In days of old, a small flag would be flown from the Beehive (the executive wing of the New Zealand parliament building) if a very windy day was expected. The quaint tradition still stands, but sadly people probably just check on the internet now. There’s quite a lot of wet days too, with 1,244mm of annual rainfall on average. Snow is rare here, but weirdly it did fall on the city in July and August 2011. Basically, bring a warm coat. If strong gusty wind wasn’t enough for you, the ground also shakes fairly regularly. A major fault line runs right through the middle of the city, which has caused Wellington a history of earthquakes, some more serious than others. The biggest was the Wairarapa earthquake of 1855, which came to dramatically change the physical appearance of the city. Measuring a whopping 8.2 on the Moment scale, the quake lifted a huge amount of land out of the sea, shrinking the harbour. The enterprising Kiwis used this extra land to grow their city on, which is why the modern harbour is now much smaller. You’ll even find streets almost 200 metres from the shore that were once seaside promenades, such as Lambton Quay. In fact, an earthquake strikes Wellington approximately every five years, but it’s not as scary as it sounds. It’s actually a ‘slow quake’, lasting a whole year each time it happens, so people barely feel it. Fortunately, Wellington’s building regulations are always improving and old, unstable constructions are regularly taken down. Wellington’s population is currently at about 412,500, but it’s expanding faster than ever before. Between 2015 and 2016 it grew by 1.6%, with net migration growing by 3,800 people in the same period. Exciting times. In terms of languages, English naturally takes the top spot with 91.4% of the population speaking it, but French comes in second (with a comparatively minute 3%). Maori, Samoan and German make up the remaining five. Before we get stuck in to all the fun details of actually living in Wellington, there are a few practical things you should know about first. Fortunately, if you’re an Australian citizen then you don’t need a visa to live and work in New Zealand. Check out our full page about it here. The go-to place for Aussies living in Wellington is the Australian High Commission. It sounds big and scary but they can help Australian expats. You can find it on 72-76 Hobson Street in Thorndon. Use the table below to give you an idea of how much it will cost to move your belongings to Wellington. But remember: it is only an indication! Costs can vary greatly depending on how much you bring and where your stuff sails from. Source: WorldFreightRates.com (estimates based on a 20ft container of household goods worth USD$70,000). Information accurate as of January 2018. Once you’ve got all the practical considerations out of the way, you can start thinking about what it will be like to live and work in Wellington. The recent story of Wellington’s economy is a happy one. The city’s record population growth has ushered in a period of serious rejuvenation, affecting everything from spending and investment to employment and trade. 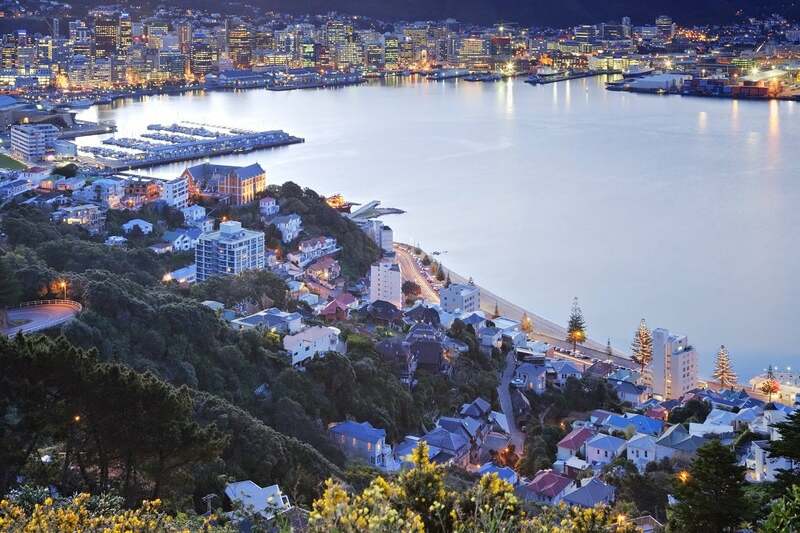 As an increasingly global city, Wellington enjoys a largely service-based economy, focusing especially on technology, finance, health, scientific research and public sector administration. There’s also a very exciting creative and digital sector in Wellington, responsible for much of New Zealand’s most famous film productions (think The Lord of the Rings and The Hobbit). Companies such as Weta Workshop, Weta Digital and Park Road Post Production are Kiwi masters at visual effects. Investors in Auckland are starting to move down south, and some of the major companies based in Wellington include Centreport, Kiwibank, Z Energy, Todd Corporation, NZ Post and Cooperative Bank. The port of Wellington (located on the west side of the harbour) is the beating heart of the city’s economy, dealing with about 10.5 million tonnes of cargo per year. Tourism has also seen a significant surge there in recent years, leading to a thriving retail sector and many a cruise ship making its way into Wellington harbour. Again, it’s good news. You probably need a job in Wellington and it turns out there are currently vacancies galore as the city continues to grow. The focus on service-based and ‘knowledge intensive’ industries is pretty heavy here, with 47% of Wellington’s workforce in these industries compared to New Zealand’s national average of 33%. Don’t get too excited, but Wellington has the largest number of digital technology companies per capita in the country, so if you’re heading over there with any kind of tech skill then you can count your lucky stars! Of course, in an expanding city like Wellington there are opportunities for everyone, from the buzzing tourist industry down to the harbour and the port. High value manufacturing also makes an important contribution to the Wellington region’s economy. Bringing little ones with you? See below to educate yourself about the schools and universities in Wellington. The standard of secondary education is extremely good throughout New Zealand, and it’s no surprise that some of the country’s best public and private schools are in the country’s capital. Secondary education in New Zealand is typically five years long, starting at Year 9 (between 12 and 13 years of age) and finishing at Year 13 (between 17 and 18 years of age). You can see the complete list of Wellington secondary schools here. Likewise, Wellington’s university game has been strong for a long time. They don’t skimp on higher education here. Here are a couple of Wellington’s best universities. Victoria University has an illustrious 115 years of history, originally founded in 1897 and of course named after the British Queen Victoria. It is one of the oldest and most highly regarded universities in New Zealand, ranking a respectable 219th in the QS World University Rankings of 2017. Students at Victoria pick up a world-class degree but they also get to live in Wellington while they do it, the lucky blighters. Massey University is actually primarily based in Palmerston North (about 140 km north of Wellington) but it also has big campuses in Wellington and Albany. The university caters to more than 3200 students and offers 31 undergraduate majors. In particular, Massey University is the only place in the whole country to offer degrees in aviation, nanoscience, veterinary medicine and dispute resolution. The capital city campus is blessed with a pretty ideal spot, situated between the Prince of Wales Park and Alexandra Park. Most of the healthcare services in New Zealand are subsidized by the government, so it’s a bit like Medicare. Fairly unique to New Zealand is the Accident Compensation Corporation (ACC), which provides insurance cover to everyone in the country after any kind of accident, even if it’s their fault. It’s a much-loved service in New Zealand and Kiwis pay for their ACC cover through a monthly, compulsory levy on their income (currently NZD$1.21 per NZD$100). One pretty cool benefit of living in Wellington is that the ambulance services are free, whereas in all other areas of New Zealand you have to pay for them. There are four public hospitals and four private hospitals in the Wellington area, and you can read about them here. All free healthcare services in New Zealand are available to any expat as long as they hold residency or have a work visa that is valid for at least two years. Luckily, most Australian citizens can acquire permanent residency the moment they touch down in New Zealand, so worry not. Wellington has a pretty good safety record, with a crime score of 29.17 on Numbeo, which is described as ‘low’. A survey of Wellingtonians back in 2011 found that 72% of people felt ‘safe’ or ‘very safe’ while walking alone at nighttime. However, don’t throw all caution to the wind; maintain proper vigilance at nighttime and listen to local advice. Wellington might be one of the world’s best bargains. You get a great city in a beautiful setting without paying premium prices. In the 2017 Mercer Cost of Living survey, Wellington comes 86th! Hold on, this is better than you think; the cities are ranked from most to least expensive, so the lower down, the better. For a capital city, this is an excellent score, especially considering six Australian cities sit higher up the table. Auckland also places as more expensive (at 61st). According to Numbeo, consumer prices are 12.37% lower in Wellington compared to Sydney. Check out the table below for a little more detail. ‘Pedestrian-friendly’ is an understatement here. Wellington practically invites its pedestrians home for dinner. The centre of the city is extremely compact and small, measuring only two kilometres in diameter. You can walk the length of Lambton Harbour in just over twenty minutes. However, there are loads of options for people who don’t fancy a walk, especially if you’re travelling to the suburbs outside central Wellington. If you google pictures of Wellington, this thing will appear all over your screen. The typical photo is of a big red bus-like vehicle zooming past with the city in the background. The Kelburn cable car has been operating since 1902 and has gradually become a Wellington icon. It runs regularly from Kelburn, a hilly suburb just outside the city centre, to Lambton Quay, which is the main shopping street. The service is super regular, with a cable car running every ten minutes to make the five-minute journey into the CBD. Above all else, it’s a handy way to catch a wonderful view of the city. Adult fares usually cost around $3.50. Life in Wellington, however, would feel fairly limited if the cable car was your only option. A bus service run by Metlink serves every part of the city, operating along the ‘Golden Mile’ from Courtenay Place to the railway station. The train is a better option if you want to get further out of the city into the suburbs and neighbouring towns. Along with the efficient daily commuter trains, Wellington is also connected to other cities on the North Island, with the Capital Connection service heading to Palmerston North and the Northern Explorer going all the way to Auckland. If you want to confuse yourself and leave the south end of the North Island for the north end of the South Island, then the ferry is your best bet. Two services – the Bluebridge Ferry and the Interislander Ferry – both head up and down the Cook Strait between Wellington and Picton. The two ferry terminals are situated pretty close to the train station, Bluebridge terminal being a short walk away and Interislander terminal accessible by a $1.80 shuttle bus. There are two major roads running into Wellington from the rest of the North Island. In a feat of real imagination, they named them State Highway 1 and State Highway 2. The first is north-west bound from the centre while the second is north-east bound. No point having south-bound roads unless your car can float. As Wellington is surrounded by mountains to the north, the drives in and out of the city are particularly beautiful. State Highway 2 crosses the breathtaking Rimutaka Ranges on a pretty narrow stretch of road. Aussies are permitted to drive in New Zealand if they have a valid driver’s license, but this privilege lasts only 12 months; after that, you’ll need to get a proper New Zealand license. The Kiwis drive on the left over there, just like you. Interesting fact: you cannot fly any further than Singapore or Fiji from Wellington airport without stopping somewhere, as the runway in Wellington is too small for larger planes. Nevertheless, it might be small but the airport looks lovely, sitting on a narrow strip of land (called an ‘isthmus’) with sea on either side, located about 6 km south-east of the centre. You can make lots of domestic journeys from Wellington, with flights to Christchurch, Auckland and Palmerston North, amongst other cities. If we start talking about the general ‘Wellington region’ then things start to look a lot bigger. Three smaller cities just north of Wellington, called Porirua, Upper Hutt and Lower Hutt, sit so close to the capital city that they are often grouped into one single area. The Wellington urban area is made up of these four local authorities. There are great neighbourhoods scattered across the whole area, but our favourites are all generally situated in the central Wellington district. Take a look at MoveHub’s selection below! (The current median house price in the capital city is AUD$493,501). This beautiful suburb gets its name from the hilly landmark right in its centre, offering fantastic views of Wellington harbour down below. Together with Mount Albert about 4 km away, the pair of peaks forever commemorate the British Queen Victoria and her husband Prince Albert. How romantic. Mount Victoria is situated in the southeastern end of the CBD, meaning it’s only walking distance from all the important stuff. 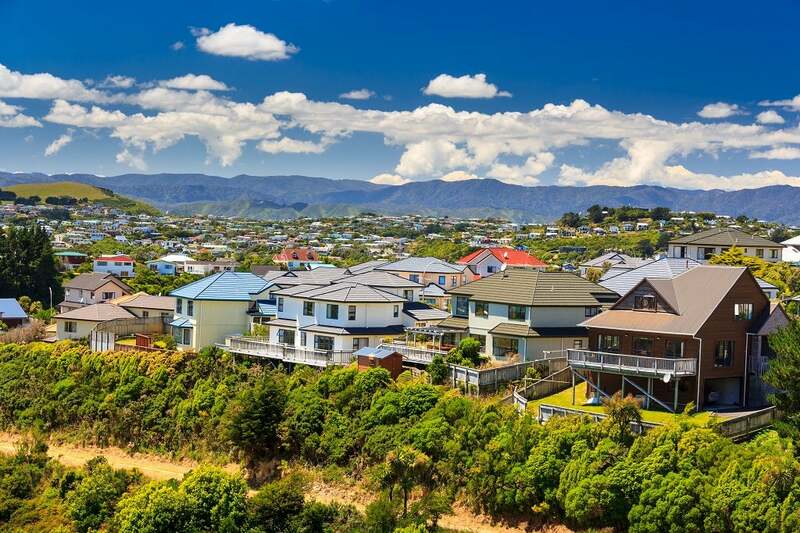 The best properties in this district are on the hillsides overlooking Wellington, comprising hundreds of white wooden houses. You might recognise some of the forest area here from the Hobbiton Woods in The Lord of the Rings films! The median house price here is AUD$454,317 (according to QV New Zealand). Choose any neighbourhood in Wellington and you’re sure to find at least something picturesque. Miramar boasts some seriously stunning coastlines, with the Miramar Peninsula jutting out into the sea and looking a bit like a motorbike sidecar. 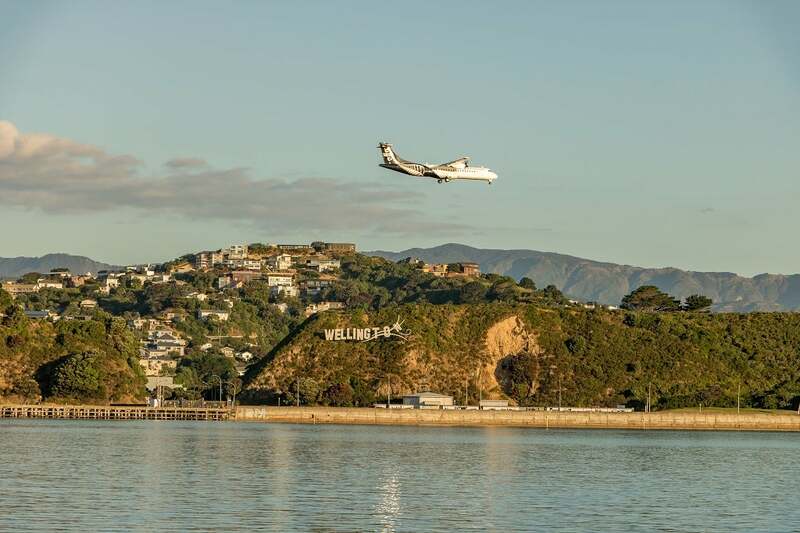 In a nod to Hollywood, Miramar is perhaps most famous for its ‘WELLINGTON’ sign, standing in huge white letters along the district’s western coastline – just in case you ever forget where you are. The suburb has a fancy polo ground, the Weta Workshop film studio and a fantastic park. The median house price here is AUD$686,634 (according to QV New Zealand), which is a little pricier than Mount Victoria. You’re further from the centre, but you’re paying for the setting. The sea is a recurring theme amongst the Wellington suburbs. Unsurprisingly, Oriental Bay sits right beside the sea, lying on the northern slope of Mount Victoria. The district was first known as Duppa when the only person living there was a Mr. George Duppa, but he decided to find a more democratic name once it started filling out, taking inspiration from the name of the ship he arrived on in 1840 (called the Oriental). As the closest beach to the city centre, Oriental Bay becomes a tourist hotspot in the summer months, so think about that before you look at buying a house here. The Oriental Parade is a superb promenade running along the coastline, including a gorgeous yacht club and a series of luxury apartments. However, proximity to the ocean has a price, and the median house price is AUD$1,003,913 (according to QV New Zealand). You’re never too far from anything in Wellington, but if you want to be really close to the entertainment, choose Te Aro. It is located right in the heart of the city and home to the very long, bar-filled Cuba Street. Unlike the hillside suburbs that surround Wellington, Te Aro is a mostly flat affair, so the views aren’t as good but the walking is less arduous. The district is packed with cultural stuff, boasting three cinema complexes, several theatres and The Opera House. The rather splendid Bucket Fountain is also located in the middle of Te Aro. For a central suburb, house prices are very cheap here, with a median value of AUD$480,773 (according to QV New Zealand). Back in 2011, Wellington was named ‘the coolest little capital in the world’ by Lonely Planet. The award is a little outdated but, if anything, Wellington has only got cooler since then. Its unique setting and relaxed culture have proved a winning combination for expats the world over – no wonder the city’s population is growing so quickly. The geography and climate of the city have played a huge role in shaping its culture, with outdoor activities coming to define the Wellington lifestyle. People can walk, skate, cycle, swim and sail in the most beautiful of settings without even having to leave the city. Wherever you are in Wellington, the windy waterfront is always either a part of your activity or a beautiful backdrop for it. There are stacks of options when it comes to doing stuff in Wellington. Here’s a handful of the things you can do and see. If Wellington isn’t idyllic enough for you, head to the paradise on the edge of town. Zealandia ecosanctuary is nestled in the hills about 2 km away from the city, and boy is it worth a visit. The ambition behind this project is staggering, aiming to restore the valley to its pre-human state over the next 500 years. So if you want to give them half a chance then you probably shouldn’t visit. It consists of a reservoir surrounded by tree-covered hills, housing forty species of bird (including the Kiwi bird, of course). Buses 3 and 20 will take you to the ecosanctuary, although they’re careful not to stop too close. This place is the epicentre of bohemian Wellington, heaving with cool bars, clubs, cafes and shops. Its second-hand boutiques are so good that Cuba Street has come to be regarded as one of the best places for vintage shopping in the whole of New Zealand. The street was in fact named after a settler ship that arrived in Wellington in 1840 (called the Cuba), not the Caribbean country. After you’ve filled up on great food and drink, step outside and see the many buskers and street art exhibitions. It’s one of those rare places where the locals love it just as much as the tourists do. No secret anti-tourist hiding places for Kiwis here; they all flock to the fantastic Cuba Street. You can’t move for museums, galleries and historic sites in Wellington. The list is so long it’s almost a bit silly, so we’ve cut it down a bit. First and foremost, you should see the Old Government Buildings, which includes one of the largest wooden buildings in the world. Te Papa, the national museum of New Zealand, is housed in Wellington, offering fascinating exhibitions along with (mostly) free admission. Aussies will certainly feel at home in the New Zealand Cricket Museum, which pays homage to one of the nation’s most popular sports. You will also find over fifty art galleries in the capital city, including the fun and contemporary Artrium Gallery. Hiking and biking are both super accessible when you’re living so close to the mountains. The larger Wellington region boasts approximately 500 square km of parkland and forests, along with 363 km of hiking trails and biking tracks. We’ve already mentioned the Kelburn Cable Car as a great way to catch magnificent views of the city, especially once you reach the top of the Botanic Gardens near the final stop in Kelburn. There is also the lookout from the top of Mount Victoria for views looking the opposite way across the city. A particular green space highlight is Central Park, a great open space for exercise that’s sheltered by massive eucalyptus trees. While it has nothing to do with New York’s Central Park, this park is located just off Brooklyn Road. Check out some of the major celebrations that come round to Wellington every once in a while. This festival is as big as it sounds. In fact, it’s so big that it only comes around every two years. For three weeks in February/March, much of Wellington is transformed into a buzzing centre of culture and art. The festival fever seeps into almost every street and lane, with waterfronts and buildings all the way from Roseneath to Pipitea embracing the celebrations. Name any kind of art and you’ll find it here, from theatre and dance to music, poetry and cinema. Each day, the festival’s calendar is filled with exciting options across the city. This annual music festival is still pretty young, having started in 2007. It’s undeniably one of the things that’s keeping Wellington so cool, always headlined by some of the continent’s most current and avant-garde names. The event is also blessed with one of the best settings for a music festival worldwide; the Wellington waterfront. If you’re not enjoying a song, you can just gaze at the sea until it’s over. It takes place in early April each year. Puns are never a good idea and this one is no exception to the rule. Nevertheless, Beervana is Wellington’s increasingly popular celebration of all things beer. The festival hits Wellington for a quick, beer-fuelled two days in mid-August each year. Wellington Stadium becomes a sort of shrine to alcohol, filled with staggering brewery displays and crazy beer cocktails. It’s so exciting that the website even has a live timer counting down to the next festival. A cool city like Wellington wouldn’t be nearly as cool without a proper ‘cafe culture’. Yes, cafe cultures exist in many cities around the world, but Wellington’s is up there with some of the best. The city claims to have more restaurants and bars per capita than New York City, so you’re never short of choice while you’re there. The food on offer ranges from delectable New Zealand lamb and fish dishes to sensational European and Asian cuisine. On the days when traditional Kiwi food doesn’t take your fancy, you can grab something from the many Malaysian and Turkish places. The popular British ‘fish ‘n’ chips’ is also easy to find along Wellington harbour; fresh, delicious and usually very affordable. What’s more, in a small city, none of these choices are too far from each other. Wellington actually has over 750 restaurants and cafes, so we’ve picked out a handful of our favourite places to eat in Wellington. This is probably one of the most exciting restaurants in the capital city. In a cosy and intimate open-kitchen experience, diners perch around tables on bright orange stools while the kitchen team cook their meal right in front of them. Instead of having to go to several places for different types of cuisine, Shepherd puts it all under one roof, with menu items ranging from Cloudy Bay clams and creamy blue cheese to crunchy Korean kimchi. Friday 13th is a famously unlucky day, but not for Logan Brown. Since opening on Friday 13th 1996, the restaurant has grown into a very popular Wellington establishment. Its setting is superb, housed in a beautiful former National Bank of New Zealand building and fronted by a pair of dazzling red doors. Logan Brown proudly wave the eco-friendly flag, using only local and sustainable produce. A bit like a hard-working boy scout, the restaurant have now achieved ten Conscious Consumer badges. Amongst loads of amazing seafood, their grilled whole sole with beurre noisette is definitely worth a try. Operating since about 1920, Harbourside Market now receives around 25,000 visitors every Sunday, serving the local people of Wellington with fresh fish, meat, fruit, veg, bread, cheese, confectionary and spices. It’s a wonderful sensory overload right by the sea, with buskers playing while shoppers float between stalls. The best thing about the market is the mind-boggling variety of food. Along with traditional Kiwi food vendors you will also find cuisine from all over the world, so take yourself down to the harbourside for some of New Zealand’s best Cambodian, Mexican and Indonesian grub. Just like Australia, New Zealand loves its sport. The biggest is undoubtedly rugby, which is probably more important to most Kiwis than food or water. Watching the mighty All-Blacks play rugby at Wellington’s 34,500-capacity Westpac Stadium is surely one of world’s greatest sporting experiences. The stadium itself is a phenomenal construction, sitting right beside the sea at the northern end of Lambton Harbour. The other beating heart of Wellington’s sport culture is the Basin Reserve, where Aussies can get their cricket fix and watch the New Zealand national cricket team compete with the rest of the world. It’s a more traditional affair than the Westpac stadium, with a lovely grass embankment and a pavilion from the 1920s. Unlike rugby and cricket, football is nowhere near as popular, but it’s on the rise. In terms of women’s sport, netball wins the crown of popularity in New Zealand. The country’s national team (called the Silver Ferns) are brilliant and have dominated world netball for years. The bustling bar and club scene in Wellington really does bustle. Party vibes spread all over the city once the sun sets, but the real nightlife centres are located on Cuba Street and Courtenay Place. A place for coffee and street art in the day, at night Cuba Street turns into a colourful avenue of cocktails and beer. Day tourists and bohemian cafes give way to clubs and bars with an electric atmosphere. You barely need to think about where you go on Cuba Street because practically every place is brilliant, especially the underground clubs. Head only half a kilometre southeast and you’ll reach Courtenay Place, a similar story of exciting clubs, craft beer pubs and sports bars. Check out some of MoveHub’s favourite Wellington nighttime establishments. Matterhorn’s story of transformation is an interesting one, beginning as a Swiss coffee house in 1963 and becoming now one of the most in-demand cocktail bars in New Zealand. While it can make the menus a little hard to read, Matterhorn boasts an alluring atmosphere of low, ambient lighting, tucked away down an alley away from the noise of Cuba Street. There are some seriously good cocktails here, such as the pear vermouth & saffron preprandial or the warmed coconut butter, rum & bitters digestif. We told you Wellington loved its craft beer, and nowhere is this more evident than in Malthouse, a place that’s constantly trying to assert beer as the best alcoholic beverage in town. They like to get technical about it, with nearly thirty taps on the bar, over 150 different bottled beers and fridges that cover six different temperature zones. There’s being serious about beer and then there’s this. The beer menu is of course a many-paged affair, including the Epic Hop Zombie, the Tempest Mexicake and the mighty Mountain Goat Barrel Breed Imperial Stout (12.5% abv). This is one of the best places in Wellington if you want a proper club. It sounds communist but it’s actually just very red. Along with some pretty fantastic decor (such as Egyptian chandeliers and ottomans), there’s also an ice-topped bar on which people try to leave their handprints. It’s the perfect place to let your hair down in an elegant setting after a very windy Wellington day. If you want to learn even more about Wellington and its history, try dipping into a book. We’ve recommended some of the best novels and non-fiction titles that feature the New Zealand capital. My Wellington Place (2016) by Tim Stokes – an entertaining and thorough guide to the city, covering everything from local schools and property to weather conditions and demographics. The Garden Party (1922) by Katherine Mansfield – the setting of this delightful short story is based on the Kiwi writer’s childhood home in Wellington.